Chelsea Team of 2004/05 – One of the Premier League’s Best. There have been some fantastic teams to grace the Premier League over the years. The best players in the world have been led by the greatest managers to create unstoppable forces who have stood head and shoulders above those around them. Manchester City’s dominance during the 2017/18 campaign has reignited the debate about who is the best team in Premier League history, with Arsenal’s ‘Invincibles’ and Man United’s treble winners among the contenders. 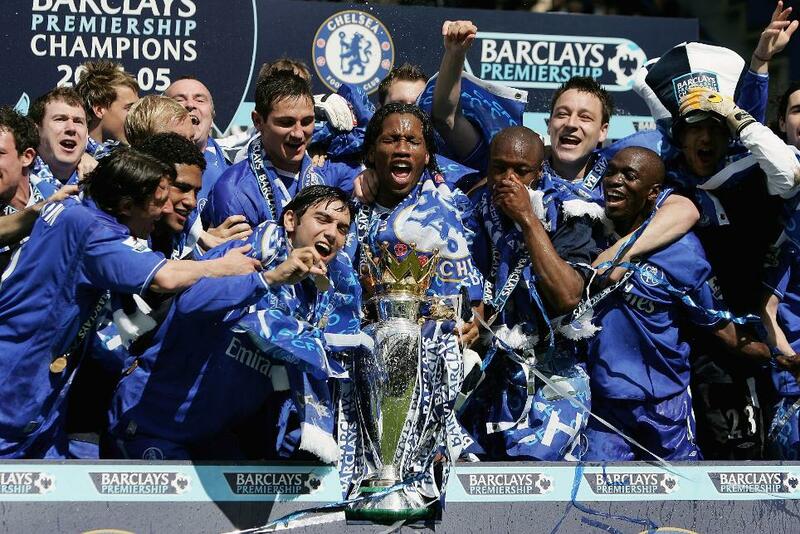 According to a recent blog post by Betway, they are all beaten by the Chelsea title winners of 2004/05. Let’s see why by taking a trip down memory lane and remembering that glorious season. After several seasons in mid-table obscurity, fortunes picked up for Chelsea during the mid-90’s and a sixth place in 1996/97 was to propel The Blues on to the list of potential title winners. That was the start of seven top-six finishes in a row, including a third in 1998/99. Chelsea had become a permanent fixture at the top end of the Premier League table, but they hadn’t yet kicked on enough to put in a real challenge to the likes of United and Arsenal. However, that all changed in 2003/04 when only an unbeaten campaign by the Arsenal ‘invincibles’ kept Chelsea from their first ever Premier League title. The second-place finish was the highest in the top flight since winning the old Division One in 1954/55 and things were on the verge of getting better. After that second-place finish in 2003/04, there were big changes at Chelsea. Roman Abramovich had invested heavily and wisely into the club and wanted instant rewards. Claudio Ranieri was replaced as manager by Portuguese Jose Mourinho, who had just led Porto to the Champions League trophy. He brought in Chelsea legend Steve Clarke as his assistant and several new faces were added to the playing squad. French Ligue 1 Player of the Year Didier Drogba was the most expensive acquisition, joining from Marseille for around £23 million and four other new signings cost more than £10m. Paulo Ferreira and Ricardo Carvalho followed Mourinho from Porto for a combined fee of over £33m, rising Dutch star Arjen Robben cost around £12m, and Tiago was the other player to command a double figure transfer fee. Also added to the squad before the season started were Czech Republic international goalkeeper Petr Cech, who had agreed a move from French club Rennes during the previous season and became the club’s most expensive ever keeper, and 2003 Dutch Footballer of the Year Mateja Kezman. A 14th minute goal from Eidar Gudjohnsen was enough to start the season off with a 1-0 victory over Man United, which was the first in a common occurrence during the season. In fact, eleven Chelsea victories ended 1-0 during the season. The defensively strong unit kept seven clean sheets in the opening eight matches of the campaign and twenty-five in the league in total during the season. This was a new record for most clean sheets in a season and just one of a number of records Chelsea set during this remarkable season. They had most away wins in a single Premier League season with fifteen (just beaten by Manchester City), most wins a single season (29) beaten by Antonio Conte side last term with 30 and now Pep Guardiola's City side with 32, Least away goals conceded in a season (9), fewest goals conceded in a season (15), most consecutive away wins in a season (9) beaten again by City this season, and highest points total in a season (95) which has been beaten this year by City. A Nicolas Anelka penalty to give Manchester City a 1-0 win in game week nine prevented Chelsea becoming the second Premier League ‘invincibles’, but that still didn’t prevent them winning the league with a higher points margin than Arsenal did the season before. The success of the season can be summed up by looking at individual honours. Manager Jose Mourinho was named Premier League Manager of the Season, top scorer Frank Lampard picked up several awards including FWA Player of the Year, Premier League Player of the season, and PFA Fans Player of the Year. Petr Cech won the PL Golden Gloves award, and John Terry, Arjen Robben, Lampard and Cech were all named in the PFA Team of the Year. Another player who picked up an individual honour during the campaign was Joe Cole, who was Player of the Month in March 2005. 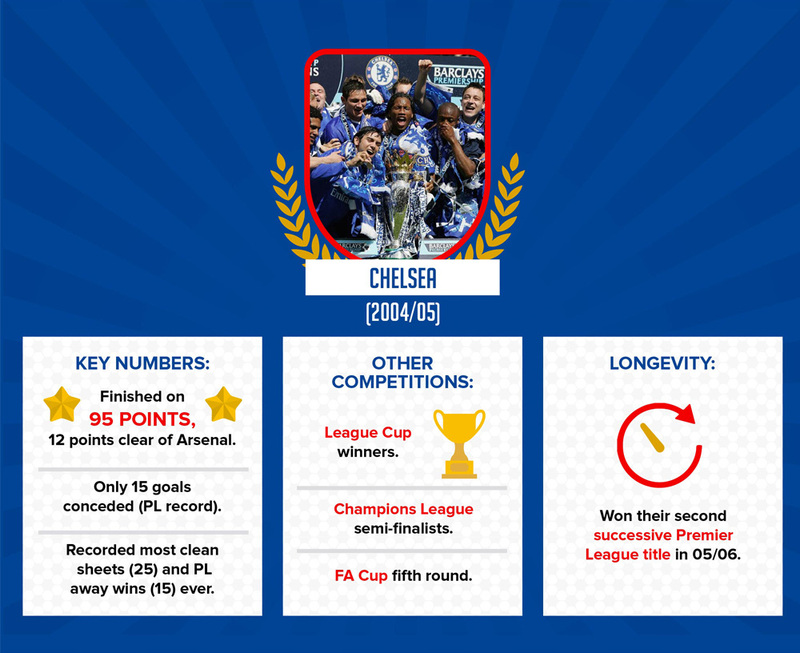 Premier League glory was the icing on the cake for Chelsea and gave them their first English top-flight league title for fifty years. A League Cup trophy meant a domestic double but there was again disappointment in the FA Cup and in Europe. Newcastle were the victors in an FA Cup tie played just three days before The Blues were scheduled to travel to Spain for a Champions League tie against Barcelona. Chelsea were victorious over two-legs in that tie, and overcame German giants Bayern Munich in the Quarter Final, before an agonising 1-0 aggregate defeat to eventual champions Liverpool in the last four. Cup disappointment couldn’t take away from the fact that Chelsea were head and shoulders above everyone else in the Premier League during 2004/05 and fully deserved the first of five PL titles. They were superior in every department and that team will be remembered as one of the, greatest Premier League teams of all time.